Coaching and Mentoring – @the sparklingnewyou~how can coaching help ? Sustainability has become a big issue in today’s modern age. The more we are becoming aware of the side-effects of modern living and the adverse effects of technology on our lives, the more the concerns regarding sustainability come up. See the video link below for a simple introduction to sustainable development and the Sustainable Development Goals (SDGs). The film is produced by Animaskin on behalf of UN Association of Norway and UNICEF Norway, as part of an interdisciplinary learning program for students on primary and secondary level. I like to look at this from a socialist, holistic point of view. Having lived through the Millenial bug, I remember the frenzy of it all. The world was caught in a state of panic not sure how the year 2000 will be heralded, technology giants predicted everything would stop functioning as the computer algorithms were not equipped to meet the new times. But 15 years ahead nobody talks about it anymore. However, ‘sustainabilty’ issues are very real. We are struggling with it at different levels as our existence and way of life keeps getting threatened. Socially we are challenged with issues of inclusion and isolation. We are living in a world where we are active more on social media and not in real time. The normal family routines and interactions have become a thing of the past, we struggle with interpersonal communication as we become more used to interacting on our phones and computers. Environmentally floods, earthquakes and global warming has started affecting all parts of the world. Industrialisation may have increased the economic power of states but it has put in danger the quality of life. Politically, human mass migration due to conflict has become the most critical development issue as host countries struggle to accept and settle refugees. As a social researcher, I feel we are grappling with the sustainability of our very existence on so many fronts. Having been associated with the UN agencies since 1998 working on funded education projects in Pakistan’s slum areas, I came across the various pledges taken by the signatories at UN conventions for protecting the planet and ensuring steady growth of developing nations. The Millenial Development Goals motivated the world to achieve basic targets to end poverty and provide primary education. In 2015 these were replaced by the Sustainable Development Goals. As shown in the video link these are a universal call to action to end poverty, protect the planet and ensure that all people enjoy peace and prosperity. The SDGs encompass all areas of life. They highlight the main areas that critically need our attention and work. If we wish to keep enjoying this beautiful planet, it is our duty to start taking it seriously by taking responsibility for our actions that are impacting our world. Actions need to be taken at all levels from government policy making, corporate social responsibility to imbibing the universal values in our school curricula and through individual action. Sustainable development and actions cannot be achieved unless they become a part of our everyday language. The task of saving the planet is not only for the policy makers or environmental activists, it is for each and every one of us who lives and breathes in this space. We can start by becoming advocates for the SDGs, relate them to our lives and pledge to take some action. No matter where we are, how big or small our action is, it is a step towards making the world a better place for our future generations. EDUSERVE is a private consultancy and life coaching service offering support to: 1. Organisations in integrating the United Nations Sustainable Development Goals and 2. Individuals for personal development. Welcome to the EDUSERVE community. Since you have stopped by, we are guessing you are an SDG advocate or would like to become one. 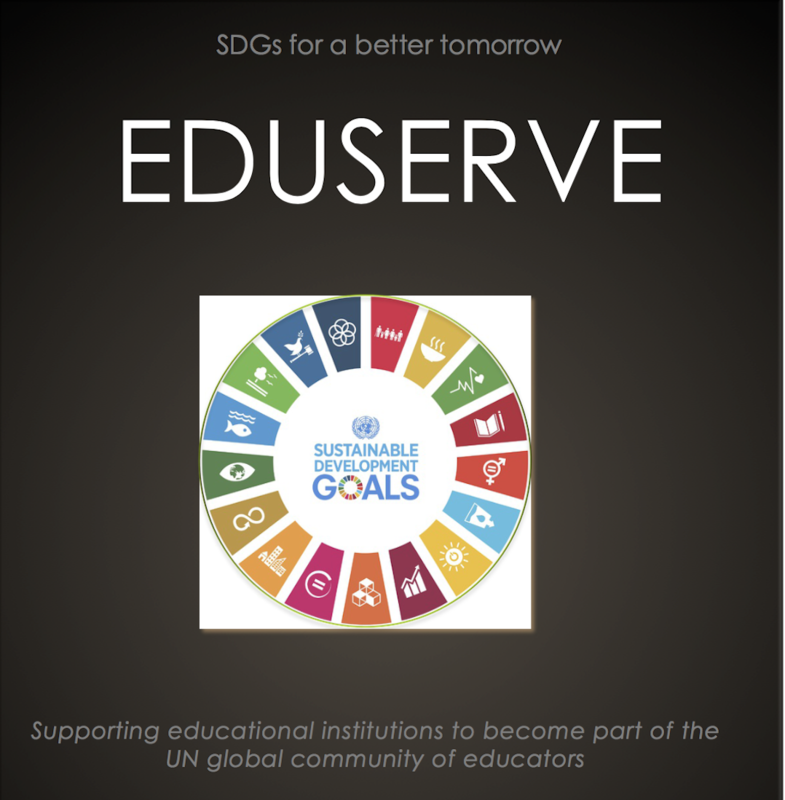 Please join the EDUSERVE community by subscribing to this website.We would love to publish your thoughts and share any projects to inspire others. You can use the contact form to send your contributions.